As coaches it is critical we know how to “enthuse” our clients, because often clients find themselves in a place where they cannot enthuse themselves. So how do we do that effectively? The act of enthusing involves “energizing” the moment. 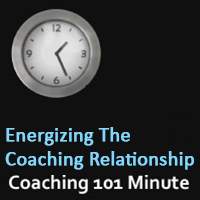 Energizing is about supporting, motivating and enthusing both ourselves and others. We all know motivation is intrinsic but we also know that positive energy is contagious. Negative energy is also contagious so we need to make a choice as to whether we want to move forward positively, energizing others as we go along. The technique of enthusing is basis to your relationship because without it you can’t create the momentum to move the client into action. As with all aspects of energizing, it has to be authentic to your personality. It needs to come from a strong desire to see the client at their best and from the joy you receive in their success. If you believe that the client’s success is your success, then enthusing them into action becomes easy. When you enthuse, you make an emotional connection with the Source. The client “feels” your enthusiasm as much as they respond to your actual words. If you think of positive energy as a fuel that powers movement, enthusing could be described as giving the Source a “boost” of enough positive energy to help them move into action. I’m so excited by this decision! Let me acknowledge how powerful you are! Did you know that enthusiasm is infectious? Positive energy builds on positive energy until positive action becomes irresistible. The more you enthuse the Source, the more they will feel positive and the easier they will become to enthuse. They will then go out into the world able to enthuse others into supporting them in their change. How will I know if a question is powerful? What is the best way to acknowledge a client’s success? What are some techniques to deal with difficult clients?